Click here for a modern aerial photo of Arborfield Hall Farm courtesy of Multimap.com, showing the remains of the WWII 'Starfish' site in the top right-hand corner, now partially covered by the Bernard Weitz Dairy Research Centre. For Wokingham Rural District Council (W.R.D.C. ), 1946 began with great hopes for new council housing, but it had trouble getting permission to build by the Government. Even private builders couldn’t get building licences, because there were many shortages that were to persist for some years yet. To take one example, although the brickworks at Knowl Hill and Arborfield were bursting with orders, even they weren’t allowed to build temporary houses for their workers. In May 1946, W.R.D.C. had issued a compulsory purchase order for a field off School Road, farmed by Mr. Wade Isaacs of Langley Pond Farm, Barkham, to be the site for new Council houses. Mr. Isaacs wanted to get on with his farming that year, and he prevented Council officials from walking on his crops, delaying surveying work. The following year, the Council stopped Mr. Isaacs from planting new crops so that they could get on with their job. The Council had setbacks elsewhere; they wanted to build off King Street Lane in Winnersh, but had to scale back the size of the site in mid-1946 because a new trunk road was being planned between London and South Wales (As it happened, the M4 wasn’t built through Winnersh for another quarter of a century). In the nearby towns, Reading and Wokingham Borough Councils tried their best to speed up the flow, both putting up their first ‘pre-fabs’ in 1946 (Whitley in January, and Binfield Road in November), but it wasn’t fast enough to satisfy demand. Soldiers were being de-mobbed and young families were looking for somewhere to live. There was desperate overcrowding. By August 1946, some people started taking matters into their own hands, ‘squatting’ in empty properties up and down the country, mostly in Army camps. All over Berkshire, sites were being commandeered, much against the wishes of central and local Government. Reading Council threatened those who’d occupied the Anti-Aircraft Battery camp in Northumberland Road with removal from the housing waiting list if they didn’t vacate within a month. Wokingham Borough Council was more successful in evicting three families of squatters from Toutley Depot, so that 10 huts could be allocated to people on the housing list. Henley Council had also been pro-active; at Dry Lees in Henley, they arranged for troops to clear huts for squatters, linking 42 ‘Elephant’ Nissen Huts to services. There were 50 families at the Northumberland Avenue site; the ‘Reading Standard’ of 30th August carried three photos of people occupying the Nissen Huts there. The ‘Reading Mercury’ of 31st August reported on Lord Portal’s generosity at Foxdown Camp, Overton, which he had bought from the Bank of England and presented to Whitchurch District Council. Other articles in the same issue recorded squatters at Heckfield (25 families) and at Odiham. At the beginning of September, a deputation from Northumberland Avenue met the Mayor of Reading, and efforts were being made to form a Berkshire Federation of Squatters. Delegates from 8 camps representing 250 families met on the parade ground at Ranikhet Camp in Tilehurst on Sunday 8th September. Apart from the two Reading camps, there were squatters from Theale, Upper Culham, Chaddleworth and Bucklebury Common. The ‘Reading Mercury' had carried an illustrated article on the Bucklebury camp in its 24th August issue, and also reported another successful ‘squat’ at Dorchester, while 5 families were frustrated in their attempt at Greenham Common. A Squatters’ demonstration was held in Reading on Saturday 21st September, with the organisers claiming that POW’s were being looked-after better than the former British servicemen. Both nationally and locally, demand was so great that by the end of the year, some 40,000 people had joined ‘Squatters’ around the country. By December, Ranihket Camp was being run by Reading Council (though by 1950 it was again in use by military, namely the Royal Army Pay Corps), and Bucklebury Common Camp was handed over to Bradfield Rural District Council by the Army. Meanwhile, squatters had occupied properties around Arborfield. By early September, seven families squatted in Barkham Manor and refused to budge. W.R.D.C.’s Housing and Public Health Committee wondered what to do with them, because these families were soon to be served with a High Court writ, and they would then be the Council’s problem. In Arborfield, it was reported in the local paper that a few families had squatted both in Arborfield Hall and in one of the bungalows. As it turned out, only one building had been involved: the Davis family had occupied East Lodge. "The Committee considered a report by the Surveyor on his inspection of Arborfield Hall and the camp, in which he stated (inter alia) he was of the same opinion regarding Arborfield Hall House was previously reported by him in April last, viz: that this property was unsuitable for conversion and adaptation for housing purposes, although he now considered the cottage (at present occupied by the "Squatters") should be taken over by the Council; further, that the huts are suitable for conversion into 15 dwellings, each with living kitchen and two bedrooms, at a roughly estimated cost of £100 per hut. "After discussion it was resolved that Mrs. Capper (the local representative) be asked to inspect the premises and that subject to the approval of the Ministry of Health being obtained to the expenditure to be involved in carrying out minimum works to adapt the hutments for living accommodation, the Surveyor be authorised to arrange for the work to be put in hand, and the Council's Officials in consultation with Mrs. Capper empowered to offer accommodation in the Arborfield Hall camp to the "Squatters" in Barkham Manor in the event of the latter being evicted by order of the Court." Before the meeting on 5th November, the Davis family had been served notice to quit their bungalow at Arborfield Hall , but they were to be offered a hut at the camp. The November Minutes reported that "A quotation was received from J. T. Cook & Sons for £3,074 for carrying out the proposed works of conversion to the hutments at Arborfield Hall Camp, and an additional cost of £202/10/- and £200 for the cost of 27 ranges and provision of water supply. Approval was given by the Ministry of Health on the understanding that the Council are satisfied that there is a reasonable prospect of all the 27 huts remaining occupied during the temporary lifetime of the huts." Also, tentative proposals were presented for division of the Hall into 6 self-contained flats with separate entrances at a cost of £1,250, to be inspected and reported back. Haslams, agents for Mrs. Allsebrook, the owner of Arborfield Hall, expressed dismay at the state the Army had left Arborfield Hall. The Council speculated whether it would be worth buying the whole property, but were put off by the £10,000 price tag. They continued to rent it. The huts were ready for occupation by the 7th January 1947 meeting, and the most-needy folk were moved in first, from all over the district. Some didn’t stay long; Mrs. Brant of Kiln Ride, Wokingham, Mr. Nun of Barkham Ride, Mr. Mackintyre of Nine Mile Ride, Finchampstead, and Mr. Robbins, also of Nine Mile Ride, were only in the huts for about a month while their own cottages were made habitable. However, others stayed for several years. The 7th January Minutes listed 11 detached Nissen Huts: 2, 3, 4, 5, 6, 7, 9, 10, 42, 43, 44, plus 14 detached prefabricated Timber Huts: 16, 17, 25, 26, 31 – 40, plus the modern brick and tile bungalow (East Lodge). It was agreed to fence-off the bank of the River Loddon as a safety measure. The 4th February meeting was told that East Lodge, recently vacated by the Davis family (who’d moved to Hut 10), was to be allocated to Mr. J. Moore, Additional Sanitary Inspector, who’d been promised it on his appointment to the Council. At the 7th March meeting, the Committee was faced with demands by tenants of the camps at Wargrave and Arborfield to lay out gardens and to grow vegetables. Even though this meant digging up parkland at Arborfield, it was decided to fence-off gardens and allow cultivation. The huts weren’t ideal; it was pointed out that the light switches turned on or off all the lights at once. The Committee recommended getting a quotation to re-wire the huts. 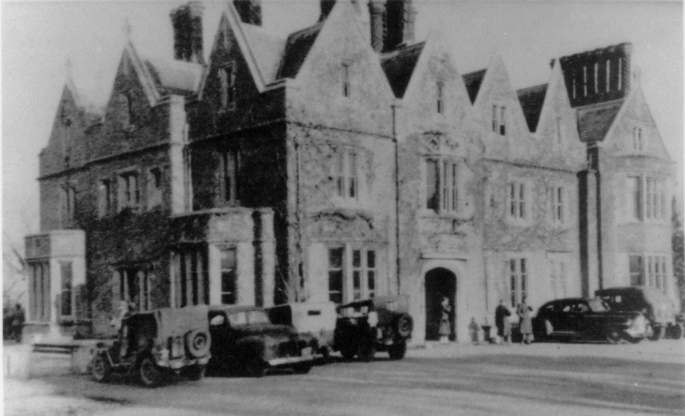 By April 1947, the two flats at Arborfield Hall were about ready for occupation. However, other parts of the mansion continued to be affected by vandalism and theft of materials. By 1950, there was a caravan site at the Camp, which provided room for a few more families. There was no pavement along the Reading Road or the Eversley Road through the village, and so the families at the Camp needed to use the buses to get to school. One couple who'd been on site since early 1947, Henry and Lucy Hiscock, of Hut 26, suffered a tragedy on St. Valentine's Day in 1950. Their daughter Esme was on her way to Arborfield Cross from the Camp, and was killed when crossing the road after getting off the bus. As a result, the Parish Council pressed ever harder for footpaths to improve road safety. The Data CD shows that several residents at the Camp from 1947 were still there and were listed on the 1950 Electoral register. 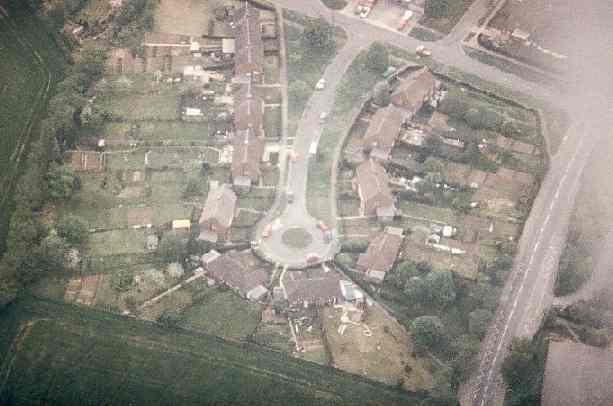 However, by 19 53, families had moved into the new ‘Newland Estate’ off School Road. The first families moved in during 1951, when the first phase of 14 dwellings in Emblen Crescent, seen on the right, were completed. Not all of the new residents of Anderson Crescent and Emblen Crescent came from Arborfield Hall camp. Some had moved from other parts of the village, especially from the Council Houses in Eversley Road, which had suffered for years from less than adequate sewage disposal: their cesspits regularly overflowed, as reported at several Parish Annual Meetings in the early post-war years. According to the 1953 Electoral register, all 20 houses in Anderson Crescent and 20 out of the 22 in Emblen Crescent were occupied. Even at this stage, eight families still lived in the huts at Arborfield Hall Camp, including the Hiscocks. By the 1954 Electoral register (prepared in Autumn 1953), two huts at Arborfield Hall Camp were still being occupied, but it was preparing for closure. Arborfield Hall had been sold to the University of Reading, and the Hall itself was demolished, to be replaced by a modern detached house. Now there is no sign that so many families had made the Camp their home for all those years. If you had lived at Arborfield Hall Camp, or if you have any family photos of life there, we would love to hear from you!